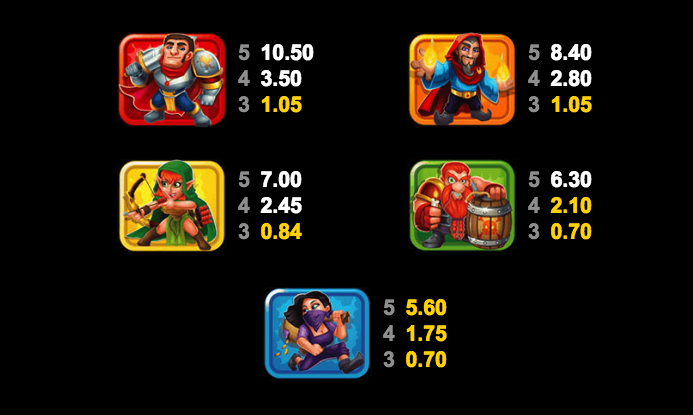 There’s a mediaeval vibe to this online slot machine from Microgaming/Slingshot which also supplies us with some cartoon graphics and a cheery view if what was almost certainly a grim time to be alive; it’s called Cash of Kingdoms and it comes with several themed features. 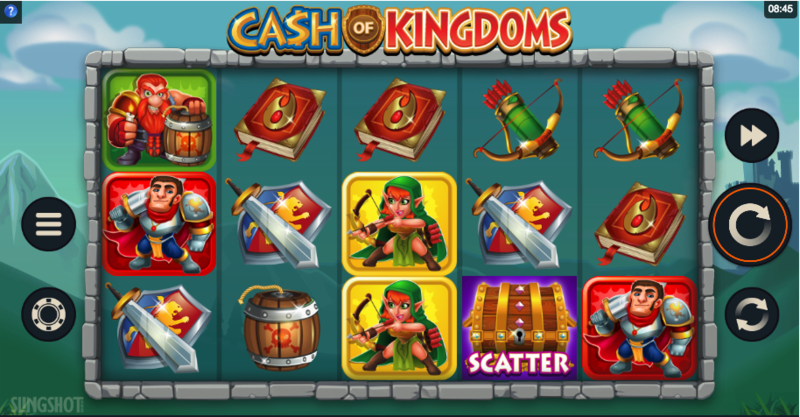 Cash of Kingdoms is a five reel slot with three rows and fifteen fixed paylines; those reels spin within a stone frame which floats against a backdrop of castles, mountains and fresh, blue skies. The five higher value symbols are all characters from this story and include the knight, the wizard, the archer, the bomber and thief; the lower values are items associated with those characters such as a sword/shield, a book of spells, an arrow/quiver, a bomb and a pouch of gold. The games logo is wild, it appears only on reels two, three and four and it will replace all others to help form winning combos except for the treasure chest scatter; the wilds are stacked on reels two and four. Wilds on reels two or four – an adjacent reel will become completely wild. Wilds on reels two and four – reel three will become completely wild. This is triggered by landing three of the treasure chest scatter symbols anywhere on reels two, three and four for which you will receive ten free spins; this round can’t be retriggered by each scatter which lands during it will award one extra spin. If reels two and four are full of stacked wilds you’re wins will be doubled as well as reel three becoming wild also. There’s nothing particularly ground-breaking about Cash of Kingdoms but that’s Ok because it’s a high quality slot with some quirky graphics and it clips along a fair old pace; the bonus features are well-designed, there’s an exciting soundtrack and an RTP of 96.28%.